Could this be Australia’s most flexible role? Imagine this…… You sell your house to move closer to the school your kids attend, you’re looking for somewhere within proximity to walk them, when your 8 year old daughter says….. Resigning from a job you LOVE to travel around Australia in a caravan on a Family Gap Year is a BIG move to make, but it’s exactly what I did late in 2015. After procrastinating on the decision for months, in November 2015 I finally plucked up the courage to share our family dream with my boss, I came clean and broke the news to him that I was leaving at Christmas. I could see that he was genuinely happy for our family, then he said something like…..
A Family Gap Year, that’s fantastic! But why resign? Why don’t you work remotely part-time? I think it could work. I’m pretty sure I responded with…. If you haven’t picked up on it already, I work for an incredible company and I work for an even more incredible leader. Fast forward 9 months and so far our family has travelled about 35,000 KM’s in ‘Larry the Landcruiser’ towing our 21ft family van from Brisbane down the coast, stopping in some amazing locations along the way, including Tasmania, where we spent 2 incredible months. We visit small towns and big centres, we stop at any Big Aussie Icon we can find (think: Big Banana, Big Ned, Big Merino etc) and Geocaching takes us to some ridiculously special places which we would have never discovered if it wasn’t for the app. Here’s a link for any ‘muggles’ (those unaware of Geocaching). Treasure hunting aside, it’s now been 9 months of flexible work and I’m more effective than I have ever been. So effective in fact, that I am still working Full Time! 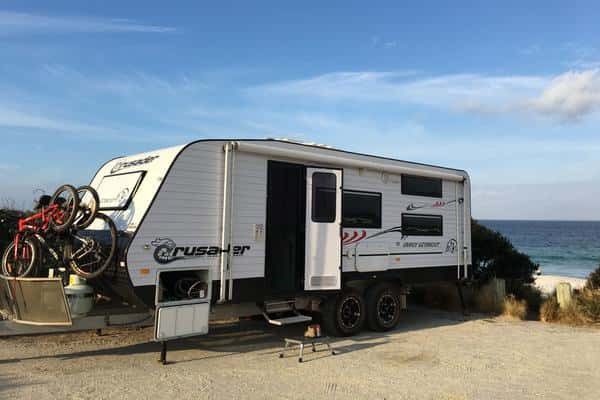 You read that correctly: I am travelling around Australia on a Family Gap Year with my husband and 2 children in a caravan working Full Time for my employer. It absolutely must be Australia’s most flexible role right? The ‘caravan of courage’ as it’s referred to by my colleagues, makes its way around the country and I connect with the team usually on a daily basis. I use Skype, email and phone exactly the same way I did when I was living in Brisbane. Most of the teams I work with are using Agile and we plan together weekly and speak daily in our stand-ups. We collaborate and connect just like any other team. Flexible work is re-shaping the Australian workforce and it’s here to stay. In a recent article published on Business Insider, titled ‘How flexible work will reshape the Australian workforce‘, I read that Envato, a Melbourne-based company announced a program last year to let employees work from anywhere, at any time. It really does work and when implemented successfully, it can produce outcomes above and beyond the everyday office environment. Maybe it’s the fresh air? Perhaps it’s all the hiking? Could it be the extra time connecting mindfully with my family? Perhaps all of the above? Whatever the combination, one thing is for sure, it’s a win-win-win for the company, for me and for our family. Everyone’s happy! What does your flexibility utopia look like? I know I have found mine and I can’t wait to share more stories from the road as we continue to make our way around our beautiful country. Could this be Australia’s most flexible role? I’ll leave you to ponder that one while taking a view of my ‘office’ on our Family Gap Year Instagram link. PS. For those Geocaching die hards, we have over 230 finds and are hoping to reach 500 while on the road…..
NB: This article first appeared on Yasmin’s LinkedIn profile.